We are here to explain the difference between permanent dentures and removable dentures. When you think of dentures you may picture of full set of upper and lower teeth but it’s also possible to have a full set of dentures which are securely fixed in your mouth. What’s the difference between these two, essentially removable dentures simply come out, sometimes when you don’t want it to. While a fixed denture stays in your mouth permanently, but when you’re choosing between these two types consider the impact your health and self-confidence. Most of the time conventional dentures work more for aesthetic purposes. As your mouth changes shape over time, you may have to have your dentures adjusted or replaced. Patients with implants do not need to worry about the implants being unfit, falling or doing simple task like eating and speaking. Once upon a time removable dentures were the best and indeed the only way we can replace missing teeth. However removable dentures came with problems, they get loose over time, you lose taste sensation, and you only retain about 30 percent of your ability to chew. When teeth are lost the supporting bone called alveolar bone also recites or melt away. This is through a process called resorption in the end what happens is your jaw bone on will also decrease and so dentures will become loose as a result you’ll begin to look prematurely aged and unhappy. There is a way to permanently replace a full set of teeth and prevent bone loss as well. Permanent dentures that are fixed to your mouth, once in place dental implants provide the stimulation and support needed to prevent bone from being lost. The bone in your jaw actually fuses to the implant implants, this makes implants strong and solid foundation for fixed dentures. When dentures are attached to implants you never have to worry that they’ll loosen or slip that means you can eat whatever you want, speak normally, and forget all about troublesome denture creams and adhesives. With implants the chances of having odor-causing bacteria in the mouth is less, because implants do not have pockets where food particles can be stuck. People who choose permanent over removable dentures report that this procedure feels much more like their own natural teeth and that it improves their quality of life. Implant supported dentures are the best long term investment for comfort, security, and confidence. What makes California Implant Smiles unique? 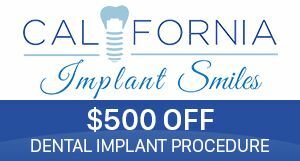 Well for one low fee we can place all the implants necessary to permanently secure and fasten your denture, we also offer a lifetime warranty which is unique to California Implant Smiles.